This town was erected from the old town of Perry (now Perrysburg), April 10, 1818. It was made to embrace all that part of the county lying south o the fifth tier of townships and west of the sixth range, its eastern boundary being the west transit line. Twelve townships of the Holland Company’s survey were thus included, and from which Connewango and Napoli were taken off Jan. 20, 1823; Mansfield and New Albion, Feb. 23, 1830; and Salamanca, Nov. 19, 1864, reducing the original town to the north three-fourths of township 3, range 7, having an area of 18,968 acres. The surface partakes of the nature of the interior part of the county, and is mainly a hilly upland, or ridges, divided by a deep valley extending in a general southerly direction. This valley is smaller than one which divides the hills father to the east, and from this circumstance received its name, which, subsequently, was applied to the town. The valley is from one to two miles wide, very beautiful, and remarkably fertile. There are also a few smaller valleys, from which the hills rise to a height of from 500 to 600 feet above the creek. The were originally crowned to the summits by forests of hemlocks and deciduous trees, most of which have been converted into lumber. Many of the hills are tillable, and most of them afford good grazing. On lot 77 the summit of the hills is comparatively level and covered by a peculiar rock formation, which has not inaptly been termed the “Rock City.” This city of stones covers an area of nearly 100 acres, elevated about 2000 feet above tide-water and several hundred feet above the general level of the valley, and is truly a natural curiosity. The rocks, belonging to the Catskill conglomeration, are arranged in large masses, resembling elevated squares, or stand upright in rows, with large fissures between them, like streets and alleys in a city. Very often these streets cross each other at right angles or suddenly terminate against the sides of perpendicular rocks from 20 to 30 feet high. These huge masses are composed of white pebbles conglutinated together, and the passage-ways have been caused by the disintegrating agencies of time, which have wasted away the softer parts of the rocks, leaving the harder portions standing. On some of them the seeds of trees took root, and, railing to find the proper nourishment on the rocks, sent out rootlets over their sides, intertwining them and adding to the picturesqueness of the scene. Some of the rocks yet support these forest giants, but in most instances they have yielded to the elements, and in their fall added to the fantasy of the place, which, by all these agencies, has been made imposing and impressive. The soil on the hills is somewhat clayey, but on the lowlands is a gravelly loam, deep and fertile, yielding rich returns of the various grains and grasses. Little Valley Creek and its tributary brooks, all draining towards the south, are the streams of the town, and afford a limited water-power. All accounts agree in placing the settlement of the present town as early as 1807. That year John Green, Benjamin Chamberlain, and probably one or two others, took up some land in the valley of the creek, but left before they had made any notable improvements. Luther Stewart, Wm. Gillmore, Alpheus Bascom, and David Powers came shortly after, and also made slight improvements, the latter building a small saw-mill. Some time during the war of 1812 these settlers left, not so much from a fear of the enemy as from the probability that the war would retard settlement so much that the country would yet for many years remain a comparative wilderness. It appears, however, that such was not the case. A few years after the peace was declared, in 1819, the following were among the landowners in the present town: James Green, lot9; George Bennett, lot12; Stephen Lampman, lot 21; David Chase, lot 21; Benjamin Winship, lot 21; Stephen Crosby, lot 22; Royal Tefft, lot22; Amos Stewart, lot 22; Enoch Chase, lot 23; Noah Culver, lot 24; David Gregory, lot 40; and John Rainhard, lot 53. Four years later, lot 11 had some improvements mad by Lyman Chase and Samuel Lyon; James Stratton and George Hill lived on lot 12; Alvin Chase and Abba Phillips on lot 13; Lyman Lee, on lot 22, on the Tefft place; David Ball, on lot 23; Guilson Morgan, on lot 24; Daniel and Simeon Smead, on lot 40; William A. and Noah Hopkins, on lot 41; and David Hopkins, on lot 65. The Hopkins brothers, David Ball, Royal Tefft, and a few others of the foregoing removed early. Some of the more prominent pioneers are briefly sketched below. It is stated, on good authority, that Stephen Crosby was the first permanent settler. He was a native of Putnam County, but removed to Cazenovia, and came from there to Cattaraugus County immediately after the war of 1812, in which he served, although but a boy. After living in Franklinville a short time, he came to Little Valley in 1816, having no neighbors nearer than Ellicottville. Mr. Crosby held many important town offices, and in 1823 was elected the first assemblyman from this part of the county. He lived on lot 22, on the present Truman Winship place, many years, but in the latter part of his life resided in Mansfield, where he died Aug. 30, 1869. A daughter, Zillah, was born in 1819, and married Nathan Crosby, also and early settler, still living in that neighborhood. David Chase, a native of Massachusetts, came to the town in 1817, and settled on lot 21, on the place now occupied by Nathaniel Bryant. A son-in-law of Chas. Bryant came to the county in 1817, but lived in Ellicottville many years before removing to this place. Among Chase’s sons was Alvin, who died on the old Culver place in 1874. Abba Phillips was a son-in-law, and emigrated to Iowa. Gaius Whiston, another son-in-law, was an early settler on lot 21. The home is now occupied by his son Norman, a well-known citizen of the town and county. Enoch Chase came at a very early day, and opened what is now known as the Coleman farm, when that locality was an entire wilderness; here he died in 1825. His sons were Enoch, Lyman, and twin sons Kimball and Johnson. In 1819, Henry Chase came to the town and began clearing up a farm on lot 23. He died in town, aged eighty-four years. One of his sons, Abner, followed from Saratoga County in 1825, and is yet a resident of the town, having attained the rare age of ninety years. Lyman Lee, a native of Massachusetts, visited the town in 1821, but did not bring on his family until the following year. Mrs. Lee brought some apple-seeds with her from Connecticut, which she planted on the place where they first lived, near the cheese-factory; and the trees from this source supplied the first orchards in the town. In 1827, Mr. Lee put up a frame house without the use of liquor, - a marvellous feat in those times, - which has always been occupied by the family, and in which E.N. Lee, a prominent merchant of the town, was born. Benjamin Winship, a soldier of 1812, on lot 21, was one of the early pioneers. The homestead is now occupied by a son, Isaac. Other sons were Nathan, Joseph, Benjamin, and Truman. About 1823, Noah Culver came from Chautauqua County, and opened a place on lot 24, - the present Jonathan Wheat place. He had sons named Noah, Eliphalet, and Lyman, who were well known among the early settlers. Simeon Smead lived on lot 30, where the Owen place now is, about 1820, and was one of the most prominent ment of that day in town. A brother, Daniel, lived in the same locality, and both removed to Burlington, Ia., many years ago. James Stratton was an early settler on lot 12, and lived in town to the advanced age of ninety years. Leander, Lorenzo, and Zebulon, were his sons. Lorenzo afterwards occupied the homestead, and about 1853 commenced to domesticate the American elk. He inclosed a tract of mountain land with a high fence, and had at one time 23 of these animals so tame that they could be readily approached. He sold a pair for $1000 to a citizen of Canada, who presented them to Queen Victoria; and others were sold to the king of Italy. Mr. Stratton removed to Tennessee, where he is said to be the sole proprietor of an entire valley. Other settlers about this period were Asaph Hyde, on lot 30, and Zuma Doolittle, on lot 40, and the Stark and Thomson families, honored and well-known members of which yet remain in town. In the northwestern part of the town Asa and Lewis Sweetland, from Genesee County, located about 1830, and, as that section was then sparsely settled, suffered many hardships. Both men were poor, and had no means of obtaining a subsistence except by making “black salts,” which they carried to Ellicottville and sold at 20 shillings a hundred. With this money they could purchase flour at Silver Lake at $12 per barrel. They often worked all day chopping for four pounds of pork or half a bushel of potatoes. Both these pioneers yet reside in that part of the town. Among their early neighbors were Jeremiah Maybee, Levi Godding, and Levi Stevens. Where the village now is, lived, among other early settlers, John Hickey and Benjamin Fuller; and south, Alfred Ayers, James Puddy, Samuel Owen, Dimmick Marsh, and William Fisher. In 1837 there were 57 houses in the town, valued at from $10 to $500. The latter was the assessed value of Dr. Alson Leavenworth’s residence, on lot 64. This was a brick house, and the first of this material in town. The population in 1860 was 1206, and in 1875 but 1147. Daniel Smead built the first frame house, about 1820, on lot 30. About the same time Stephen Crosby erected the first frame barn, on the place now belonging to E.N. Lee. In Stephen Crosby’s family also occurred the first birth, March 6, 1817, - a daughter, who was named Orril. She is at present the wife of Silas Choate, of Hillsdale, Mich. In 1825, Enoch Chase departed this life, and was buried in what afterwards became the town cemetery, near E.N. Lee’s. Probably he was the first adult to die in town. Among the early marriages are mentioned those of Gaius Wheaton and Relief Chase, and Benjamin Winship and Hannah Sanders. Luther Doolittle and Benjamin Johnson were pioneer innkeepers, the latter keeping at a place where the Coleman farm now is; and Alfred Ayers kept the first store below the village, all before 1830. The act of the Legislature of April 10, 1818, organizing the new town, provided that the first meeting should be held at the dwelling-house of Jared Benedict, on the first Tuesday of March next. But the records of this meeting, and those of the meetings up to 1823, cannot be found. On the 4th of March, 1823, the meeting was held at the house of Enoch Chase, and the following officers elected: Supervisor, Simeon Smead; Town Clerk, Guilson Morgan; Assessors, Jonathan Kinnicutt, Aaron Razey, Benjamin Winship; Collector, Nathaniel Fish; Commissioners of Highways, Gaius Wheaton, John A. Kinnicutt, Amos Morgan; Constables, Nathaniel Fish, Lyman Lee, Noah Hopkins; Overseers of the Poor, David Chase, Benjamin Chamberlain; Commissioners of Common Schools, Aaron Razey, Guilson Morgan, Simeon Smead; Inspectors of Schools, John A. Kinnicutt, Wm. A. Hopkins, Gaius Wheaton. were held April 2, 1864; Aug. 29, 1864; and Feb. 9, 1865, to vote aid to the Government in suppressing the Rebellion. At the latter meeting a bounty of $400 for each volunteer from town was voted, and E.S. McMillan, J.C. Peabody, and E. Puddy appointed a disbursing committee, with discretionary power to fill the quota under the President’s call for troops. On the 26th of May, 1865, $10,000 was voted by the town to secure the erection of the county buildings at Little Valley, and a fund of $30,000 guaranteed to the supervisors, if they should decide to locate at that point. Nov. 30, 1866, $5000 more was voted by the town to swell the fund to the required amount, and thus secured the county-seat. David Powers is credited with building the first saw- and grist-mills on Little Valley Creek as early as 1810, but no exact information can be obtained. On the same stream Alvin Chase and brother had a saw-mill at a much later period. Here is now a good mill operated by Jonathan Thompson. Other mills were formerly operated on the different streams of the town, but all have been abandoned, except a few here named. In 1868, O. and A. Brown erected a steam saw-mill at Little Valley, which was demolished by an explosion in 1872. It was rebuilt on a larger scale, but on the 5th of June, 1875, the boiler again exploded, killing David Brown (at that time one of the proprietors), James H. Wiest, the fireman, and a four-year-old son of Brown. Nearly opposite from where the Howe mill stood, William Adye put up in 1869 an establishment for grinding feed, the manufacture of barrels, and planning lumber. The motor is a 16 horse-power engine. Oscar Ayde is the present proprietor. of the town are yearly receiving greater attention. The product is principally cheese, although a large quantity of butter is made annually from the milk of the cows belonging to private dairies. The Little Valley Cheese-Factory, a mile and a half below the village, was erected by D.P. Bensley in 1867. It is a three-story frame, 35 by 75 feet, and is supplied with good machinery. Since 1875, J.M. Osborne has operated the factory, which has 25 patrons. 10,000 pounds of milk are used daily in the manufacture of 17 sixty-pound full cream-cheeses. The Larabee Creamery and Cheese-Factory, in the western part of the town, was built by E.C. Brooks in April, 1871. It is a well-appointed building, 32 by 75 feet, in a good neighborhood. For the past few years A.L. Larabee has been the proprietor and operator, and manufactures large quantities of butter and half-skim cheese. The Little Valley Creamery was established in the spring of 1877, by J.H. Mack, near the village. The factory is 30 by 100 feet, and is abundantly supplied with pure spring-water, but employs steam as the motive-power. 5000 pounds of milk, furnished by 17 patrons, are worked up daily by a process employed by Mr. Mack only in this part of the State. The milk is allowed to sour several days before churning, and is kept at a certain temperature by means of steam-pipes or ice-water, when it yields a larger amount of superior butter, whose keeping qualities far surpass butter made by the old methods. The factory is supplied with good machinery, and is conveniently arranged. This is a small hamlet, a little south of the centre of the town, with a Free-Will Baptist Church, a school-house, and half a dozen buildings. In early times it was a place of more consequence than at present, and had a store kept by David Chase. Afterwards Warren Weatherby and Edward S. Bryant were here store-keepers. A tavern was also kept a short time by Dr. Stillman Chase, who united the practice of medicine with this business to some extent. At later periods, Doctors Irish, French, and Miner were practitioners in the hamlet, which is now simply a farming settlement. is a station on the Erie Railroad, near the northwestern part of the town, about eight miles from Salamanca. It is pleasantly located on a level piece of ground, environed by high hills, which give the surroundings a picturesque appearance, and constitute this one of the most attractive places in the county. There was but a small settlement here before the railroad. In 1851, Horace Howe first platted some village lots on the small creek, where the first business-houses were erected. The same year Cyrus S. Shepard platted an addition on the east, extending down the valley; and, in 1867, John Manley platted 150 acres in the western part of the village, on which were located the county building the same year. From this time on the place has had a certain growth, and attained whatever importance now attaches to it. There are at present about 600 inhabitants, three churches, a number of public buildings and business-houses, where an active trade is carried on. The first store in the town was kept about a mile below the village by Alfred Ayers. He occupied a small building which stood near the railroad-crossing in that locality. Shepard & Smead followed in business, and later the former alone was very extensively engaged in trade, combining real-estate speculation and stock-dealing with general merchandising. His business had assumed such extensive proportions that nearly every one in the valley suffered from his failure in 1852. At the old Shepard stand L.L. Coleman and S.C. Green were also in trade, and the place was last occupied for this purpose by Weatherby & Brown. Horace Howe opened the first store in the village some time after 1850, in what is now known as the Densmore building. His business was extensive and embraced many kinds of traffic; opposite the store he erected a palatial mansion, which was reputed the finest in the county. Like Shepard, Howe met with reverses, and his failure seriously affected the prosperity of the place. The residence was destroyed by fire. S.S. Marsh, S.C. Green, J.S. Peabody, Chase & Bucklin, and S.B. Densmore followed as principal merchants. Among those at present most active in trade are E.N. Lee, R.H. Butterfield, S.A. Tuttle, and J.H. Mack. Benjamin Fuller put up one of the first taverns in the place, on the site of the “Rock City Hotel.” This was afterwards known as the Howe tavern, and was kept, among others, by John Hickey. The latter afterwards built a tavern near the railroad, which he kept many years, but which is now a residence. The Howe tavern was burned, and the present house was built about 1866, by J. Gano. 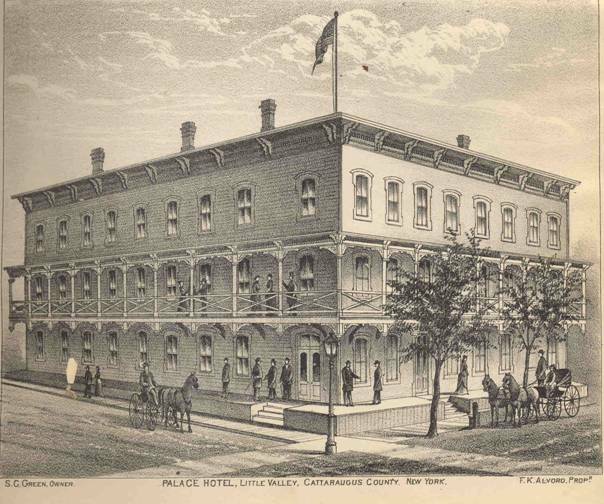 The “Palace Hotel” was built in 1876, by Henry Dow, and soon after became the property of S.C. Green, who very successfully conducted it until the spring of 1878, since when F.K. Alvord has been the landlord. It is a large three-story building with accommodations for 75 guests, and its appointments and conduct reflect credit on the place. A banking office was opened in the place by S.S. Marsh, in 1868. It became a bank of deposit and exchange, and suspended in February, 1875. The Cattaraugus Republican, a weekly journal of influence and large circulation, was removed to Little Valley from Ellicottville in 1868, and is the first newspaper published at this point. It is believed that Dr. A.B. Wilder, a native of Vermont, was the first settled physician in town. He died at Little Valley Centre. Dr. Daniel Bucklin, from Wallingford, Vt., came in 1839, and began a practice which has been continued nearly ever since. He is a resident of Little Valley, and has a contemporary in Dr. Lyman Twomley, from New Hampshire, who has here followed his profession since 1852. Doctors C.Z. Fisher and S.S. Bedient are also in practice; and Doctors Powers, Davis, Baker, and Satterlee, formerly followed the healing art in town. Simeon Smead sometimes acted as a counsel in early days, although not a regular lawyer. E.A. 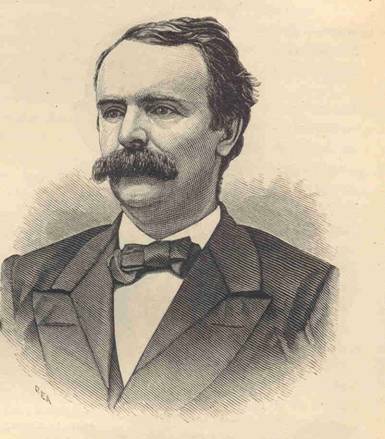 Anderson, who came about 1869, was one of the first accredited attorneys. Joseph R. Jewell was in the village from 1868 to 1872; Frank S. Smith, since 1871; Charles Z. Lincoln, since 1874; E.A. Nash, since 1876; and Samuel Dunham, since 1877, have been the practicing attorneys in Little Valley. From all accounts, a post-office was kept at the house of Stephen Crosby, some time before 1830. In 1833, Cyrus S. Shepard held the appointment, and the accrued postage that year was reported as $32.80. Subsequent postmasters have been Dimmick Marsh, Fuller Bucklin, John Fitch, Lydia Gaylord, Addie Fuller, and the present incumbent, Miss J. Woodward. The office enjoys good mail facilities, supplying the service for Napoli, and on the 5th of July, 1873, became a postal money-order office. The Little Valley Cornet Band is a flourishing organization, having a dozen members, under the leadership of James Brown, which furnishes music for public gatherings and special occasions. The village was incorporated May 9, 1876, with bounds embracing 640 acres, situated partly on lots 40, 41, 52, and 53 of the Holland Company’s survey. The election was held at “Rock City Hotel,” and of the 69 votes polled, 64 were in favor of the proposed incorporation. The first board of village officers was elected May 27, 1876, and was composed as follows: President, Stephen C. Green; Clerk, John Manley; Trustees, Augustus Hover, Almon Brown, Zina Dudley; Treasurer, Samuel Merrick; Collector, Caleb W. Barton; Police Constable, Lewis Sprague; Street Commissioner, Amos H. Bedient. In 1877, Samuel Merrick was the president, and Dell Tuttle the clerk of the board; and in 1878, the same clerk, and W.W. Henry president. Since the village has been incorporated, its appearance has been materially improved and beautified. was organized in 1872, with a capital stock of 44 shares, of $25 each. The first board of managers was composed of A.W. Ferrin, President; W.W. Welsh, Secretary and Treasurer; and S.B. Densmore, Superintendent. The water supply is obtained from the mains at the county buildings, which lead from an excellent spring a mile distant, and is abundant and of a good quality. About half a mile of pipes in the village are controlled by the company, which furnishes the water at a moderate cost to the inhabitants. began holding its meetings in the village in 1856. It first owned a lot of ten acres near Asa Sweetland’s. In 1870, a more spacious piece of ground was secured on the Little Valley Creek, in the upper part of the village, and improved for fair purposes. The first meetings of the society here were very successful, but latterly have been attended with abated interest. For the past few years the fairs have been held at Randolph. 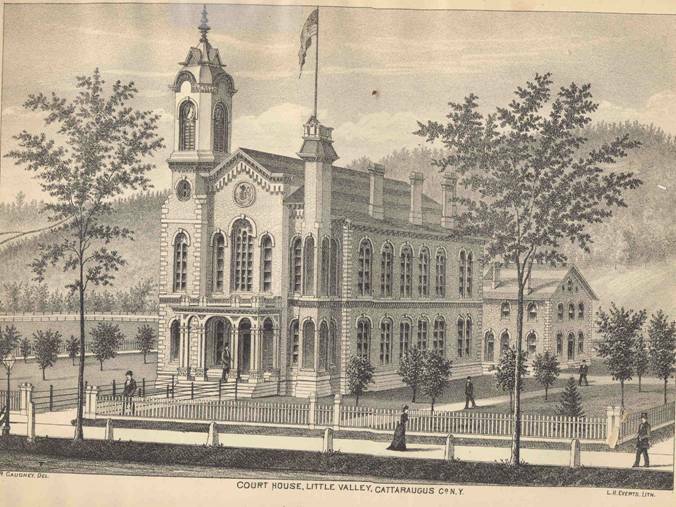 In 1867 the erection of the Cattaraugus County court-house and jail was begun on a five-acre lot, donated for this purpose by John Manley, in his addition to the village of Little Valley. The buildings are after plans prepared by H.M. White, architect, of Syracuse, and were completed in the spring of 1868. The county offices were opened May 21, and the first term of court held the latter part of the same month. The court-house is 56 feet wide and 82 feet long, built of brick, and covered with figured slate. The lower story is 13 feet high, and contains the county offices, which are provided with fire-proof vaults and rendered secure in other ways against the destroying element. The upper story is 20 feet high, and contains the court-room and its adjunct offices. The building has a handsome tower in front 100 feet high, which is surmounted by a figure of the American eagle. The style of architecture is attractive, making the building a conspicuous object in the valley. The jail also built of brick, is in the rear of the court-house, has ample room, and well serves its intended purpose. The cost of the buildings was $33,000, $18,000 of which were appropriated by the towns of Little Valley and Napoli, the balance was contributed by individuals. Among the most liberal donors were Hon. John Manley, Judge Chamberlain, Ezra Eames, and Dr. Lyman Twomley. Little Valley Lodge, No. 377, I.O. of O.F., was instituted Aug. 15, 1848, on the petition of C.S. Shepard, Abner Chase, Horace Howe, D.H. Geron, and Luther Peabody. Abner Chase was installed the first N.G. In 1850 the number of the lodge was changed to 120, by which it was recognized until its discontinuance. At that time and until 1852, the meetings were held in a hall which belonged to Horace Howe, being the building now used by McGuire as a saloon. Howe withdrew from the order and subsequently forcibly ejected the lodge, destroying its property and proceeding to other extreme acts, which created intense excitement and much bitter feeling. C.S. Shepard immediately built a new hall on the opposite side of the creek, which has generally been known as “Masonic Hall,” in which the lodge met until 1854, when owing to the demoralizing agencies at work among its members, it disbanded, and the order has since been without a lodge in the place. Cattaraugus Lodge, No. 239, F. and A.M., was instituted in January, 1851, and found a home in the old Howe Hall. Later, the meetings were held in the Shepard Hall, afterwards especially set aside for its use. For many years it flourished here, but was removed to Salamanca in 1875. Little Valley Lodge, No. 47, A.O.U.W., was organized Dec. 29, 1876, with about 20 members and the following officers: A. Hover, P.M.W. ; C.Z. Lincoln, M.W. ; S.B. Densmore, G.F.; Emery Sweetland, R.; D.F. Rundell, F.; C.L. Sprague, R. The present membership is 36, having as officers C.Z. Lincoln, P.M.W. ; M.N. Pratt, M.W. ; A.C. Merrick, G.F.; S.B. Densmore, R.; D.F. Rundell, F.; C.L. Sprague, R. The meetings of the lodge are held semi-monthly in Masonic Hall. of the town are taught in comfortable buildings, and are usually well attended. The school at the centre was the first organized. Wheelock Chase was an early teacher in winter, and Mary Marsh and Axie Fay of summer schools, at this point. The present is the second house that occupies the site. In 1828 the town was divided into districts, and liberal appropriations made for the support of schools. Willard Gould, Cyrus A. Fuller, Charles Z. Lincoln, Wm. W. Henry, and Stephen C. Green were chosen trustees of the Board of Education, which organized by choosing Willard Gould president, and Charles Z. Lincoln clerk. George E. Town is the present principal of the school, which has an attendance of 120 pupils. The town is divided into six schoold districts, containing six school buildings, valued at $3575, with 175 volumes in library, valued at $150. There are seven teachers employed, to whom was paid $1721.85. Number of children of school age, 341; average daily attendance, 172 663/1000. Amount of public money received from State, $858.63. Amount of money received from tax, $1031.55. The Free-Will Baptists are credited with organizing the first church society in town, Oct. 8, 1826, although it does not appear that a legal organization was effected until June 15, 1839. The trustees then elected were Lyman Lee, Abner Chase, Samuel Owen, Lyman Culver, Benjamin Winship, Cyrus W. Fuller, and Cyrus S. Shepard. was the first incorporated. A meeting for this purpose was held Dec. 5, 1823, over which Levi Dow and Wm. A. Hopkins presided. Benjamin Chamberlain, Smith Waterman, John A. Kinnicutt, Wm. Kendall, Jonathan Kinnicutt, and Jeremiah Maybee were elected trustees, but we have no knowledge that anything was accomplished by the organization. Services were held at stated times by the itinerants of the circuits formed in the western part of the county, in school-houses, and at the homes of the members in the northern part of the present town and the southern part of New Albion. In 1852, Randolph Ciruit supplied this section, having as preachers in charge Revs. A. Burgess and N.W. Jones. A class had been formed in the Sweetland neighborhood several years before, which was now to form the nucleus of the church at the village. Among the chief members were the Sweetlands, Thompsons, Giddings, Taggarts, and others, to the number of a score. On the 20th of August, 1858, this class was legally incorporated at a meeting held at Odd-Fellow’ Hall, and L.M. Bottsford, L.H. Wilson, Asa Sweetland, S.C. Green, and Jonathan Thompson chosen as trustees of the new body. In 1859 a frame meeting-house was erected by the society in the village of Little Valley, which was dedicated November 19, by Bishops Simpson and Ames. In this house worship was held in connection with other appointment in the adjoining town, which resulted in an encouraging increase of membership. The winter of 1877 was made especially notable by a revival whereby 41 persons were added to the church under the ministrations of the Rev. James P. Mills. The membership is at present 100. In the summer of 1878 the meeting-house was enlarged, and handsomely remodelled at a cost of $1650, under the direction of S.C. Green, W.W. Henry, and Willard Gould as a building committee, and was rededicated Aug. 1, 1878, by Bishop R.S. Foster, assisted by Prof. Bowne, of the Boston University. It is now one of the handsomest church edifices in the county, and will comfortably seat 300 persons. In the rear of the main structure is a chapel, which will seat 75 persons more. The estimated value is $3500. The parsonage, erected in 1866, and repaired in 1878, is a very comfortable home, reported worth $1500. Since 1852 the following have been among the clergy of the Methodist Church at this point: Revs. W. Chesbrough, D.C. Osborne, T.D. Blinn, S.L. Mead, J. Robinson, T. Warner, J. Akers, F.W. Smith, A. Barras, E.A. Anderson, W.W. Case, E.B. Cummings, R.W. Scot, Peter Burroughs, E. Brown, W.B. Holt, and, in 1878, J.P. Mills. A well-attended Sunday-school is maintained by the church, which is superintended by the pastor. was organized Dec. 3, 1840, at the house of C.S. Shepard, and was constituted of 17 persons. William Hall and Ira Gaylord prepared the articles of faith, and the Rev. Reuben Willoughby was the first pastor, maintaining that relation many years. On the 22d of October, 1842, Ephraim Hall and Harrison Fisher were elected the deacons of the church, and the same year Hiram Eldridge was sent as the first delegate to association meeting. For the first four or five years the church flourished, followed by a season of declining interest. The Revs. Mead, Holmes, and Leonard served short pastorates without materially increasing the prosperity of the society. Feb. 14, 1852, the Rev. Chalon Burgess was called to the spiritual leadership of the lingering body, and at once made vigorous efforts to revive the work, beginning, among other measures, the building of a church edifice, which was completed in 1853, at a cost of $2500. November 6 the following year the “First Congregational Society of Little Valley” was formed, electing as trustees Cyrus W. Fuller, Lyman Twomley, William R. Crawford, Horace Howe, and Washington D. Burgess; and for a period the church was again highly prosperous. Mr. Burgess severed his pastoral connection April 1, 1861, and for the next eight years the pulpit was supplied by Revs. Newcomb and Lowing, and by Deacon Wheeler Beardsley. This lack of pastoral care, and other circumstances, enfeebled the church so much that services were discontinued; and the house was occupied occasionally by the United Brethren and Protestant Methodists, who held services without organized societies. In 1870, the church was again reopened by the Congregationalists, who greatly improved the house, and again consecrated it to divine service, March 19, 1871. In April following, the Rev. Charles L. Mitchell was invited to become the pastor, and was installed June 28, 1871. He remained until August, 1873, and was followed by a short pastorate by the Rev. Henry Beard, and since July 28, 1874, by the Rev. J.D. Stewart. The interest has been successfully revived, and from a membership of 28, in 1874, there has been an increase to 100, as the present membership. Regular services are maintained in the church at the Little Valley and at Dublin, an out-station of the church. The church was renovated and modernized in 1878 and is now in every respect an attractive place of worship. Since its reorganization, James Chapman, B.B. Weber, and J. Wesley Sweetland have been elected deacons of the church. A Sunday-school was opened during Mr. Burgess’ pastorate, but was discontinued while the services of the church were suspended. It was successfully re-established in 1871, and is now very prosperous. The church also maintains three Sunday-schools in the country surrounding the village, having an aggregate membership of 150.
was erected in 1874, under the direction of the Rev. John Byron, the priest of the parish of Salamanca, of which this church forms a part. The house is 24 by 40, and cost $1600. Services are held once a month, which are regularly attended by eight families. Father Byron is yet the spiritual leader of the church. was formed Sept. 29, 1862, of 15 corporators and the following trustees: David L. Tate, Cyrus A. Fuller, James Chapman, James S. Beers, Asa Sweetland, George Hilsle, and Elisha J. Davis. One and a half acres of ground at the village was secured for burial purposes, and appropriately improved. The present officers of the association are George Hilsle, President; James Chapman, Treasurer; and S.C. Green, Secretary. Herman Fisher was the first person interred in the new cemetery, which now contains the graves of some of the pioneers of the town. *Written by John Manley, the personal friend of young Fuller. The war for the suppression of the Great Rebellion against the Government and Union of the United States developed the better and higher qualities of many men; others, lacking moral stamina, or physical force, or intellectual strength, fell below the just expectations of confiding communities, whose representatives they were. War at the best is destructive to morals, material, and wealth. It is also true that war promotes ambition, arouses the loftiest impulses of patriotism, enlarges and quickens the capacity of well-balanced men who become participants in its varying struggles, reverses, and victories. The successive and rapid incidents of the War for the Union too often proved that those earlier clothed with authority were not equal to its demands; and, as events passed and trials culminated, those proving unequal to command were, by the inexorable law of events, obliged to give way. Others, developing military tastes, culture, and capacity, by the same law were advanced and promoted from subordinate to superior rank. Thus, many who became leaders in the later period of the great conflict, and are now recognized as the most distinguished commanders, were comparatively unknown in its earlier days. As it was on the broader field, so undoubtedly it was with the famous regiment with which the subject of this notice cast his fortunes. Henry Van Aernam Fuller, oldest son of Benjamin and Ann Van Aernam Fuller, was born in the village of Little Valley, February 16, 1841. He had two brothers and a sister. Benjamin C. was a soldier in the 37th N.Y. V., now a clerk in the Interior Department; and Nathan A., paying teller in the United States House of Representatives during the 42d, 43d, 44th, and 45th Congresses, serving Republican and Democratic Houses with fidelity in this responsible position. His grandfather was the first settler in Randolph; his father was among the earliest in Little Valley. His father was widely known as energetic and honest; hard-working and benevolent; kindly aiding others, he subdued forests and caused the wilds to produce grain and fruit; and his mother is a lady of intellectual strength, well read, and of dignified presence. She is a sister of Hon. Henry Van Aernam, surgeon of the 154th N.Y.V., in the war, and Representative in Congress. Henry V. Fuller, Dec. 24, 1860, married Adelaide C., daughter of Dr. and Mrs. Lyman Twomley, of Little Valley. She was a lady of culture and energy, and was postmaster several years. On May 19, 1862, a son was born, Henry Twomley Fuller, of striking resemblance to his father. He is now approaching manhood, and has the noble example of a father’s manly virtues, gallant deeds, and the fame of one of the most heroic and brave defenders of his country’s liberties for an inheritance. At the head of his profession, the doctor, a genius, unmanageable by adults, is easily subdued and always yields willingly to the young scion. At the close of Prof. Love’s address, military honors were paid to the deceased. Under authority of the laws of New York, 1865, the first brevet honor conferred was by Gov. Fenton, that of Brevet-Colonel, In Memoriam, for Capt. Henry V. Fuller. He and other school-fellows desired to join Capt. Clark’s company, the “Cattaraugus Guards,” “because our brothers and friends are there.” Again, 28th of August, in reply to a friendly letter, he continued: “I am very thankful to you for the excellent advice it contains from a remembered friend. But the edifice of our nationality is in flames ! We must not stand too long in preparing ourselves to resist the scorching fire, else the structure be consumed before we are ready for its rescue.” Public meetings were held in every hamlet to arouse public spirit. At one held at the church in his native village, Prof. Love and others addressed the meeting; but it was young Fuller’s burning and eloquent strains that electrified the assemblage, and caused other to follow him by volunteering. In the mean time the 64th Regiment, New York State Militia, had been tendered to the government, and was accepted as part of the quota of New York, under the call of President Lincoln for three hundred thousand men. It was designated the “64th Regiment, New York Volunteers.” On the organization of the Army of the Potomac, the 5th New Hampshire, 81st Pennsylvania, 61st and 64th New York Regiments constituted General O.O. Howard’s 3d Brigade, of Richardson’s 1st Division, Sumner’s 2d Corps. The “badge” of the 2d Corps was the ‘trefoil,” – red, white, and blue, for the 1st, 2d, and 3d Divisions, respectively. The 64th honoured the red. Following this battle came the “Seven Days,” from the Chickahominy to the James Rivers; marching by night and fighting by day kept the army continually occupied. From Harrison’s Landing, on the James, the Army of the Potomac, in transports, returned north, landing at Aquia Creek and at Alexandria; thence continually fighting during the latter part of August, culminating in the Union success at Antietam, September 16 and 17. 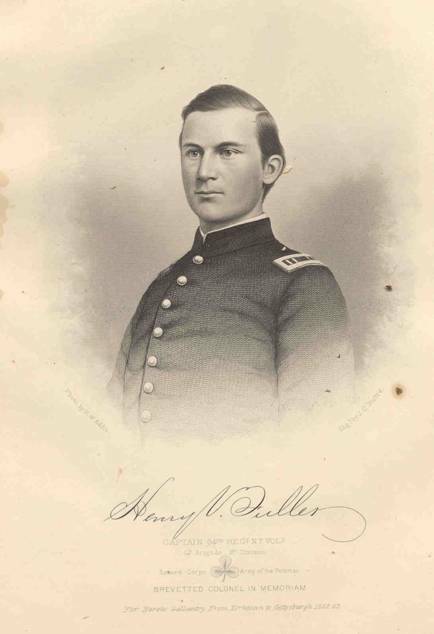 Thus young Fuller, full of patriotism, glowing with loyalty to the Army of the Potomac, loved with affection his regiment, because of its valor, name, and fame, gained in so many hard-won trials. He was magnanimous towards rivals of merited courage and worth. Colonel Miles of the 61st, so generously mentioned by him, subsequently became brigadier- and then major-general, for gallantry and brave deeds, justifying Fuller’s estimate of him; and since the war ended, is known as one of the intrepid Indian fighters of the plains. Thus young Fuller was ever generous to his rivals. His wishes were soon gratified: Lewis was made captain. Together these young officers fought at “Chancellorsville,” and at “Gettysburg,” and there, on the evening of that murderous second day, they fell in the front line of battle together! And who can doubt that their names are inscribed on the muster-roll of the God of Hosts? Colonel D.G. Bingham (three vacant captaincies existing in the 64th New York Volunteers) wrote to the Governor of New York, recommending Lieut. Fuller’s promotion as captain, saying that he was “a young man of good education and intelligence; has served as lieutenant since the organization of the regiment, acting at different times as 2d and 1st lieutenant, and commandant to company, and adjutant; and has been constantly with his regiment. He has been in all the battles in which his regiment has been engaged, besides several skirmishes; and has, in all, displayed a gallantry and intrepidity deserving reward. For these and other minor considerations, which I might detail, I hope your Excellency will favourably consider this application.” This generous testimonial did honor to Colonel Bingham, as a commander, and the honest, high-minded man he was. This recommendation was presented to the Governor by another warm personal friend of young Fuller’s, without his solicitation or knowledge. The case was so strongly and earnestly written and personally prosecuted, as to arrest the attention and enlist the favor of the Governor, and he promptly conferred the captaincy. It is no impropriety, now, to add that soon after (a vacancy they supposed to exist) the Governor decided to further promote young Fuller to the lieutenant-colonelcy. Subsequent to his death, General Caldwell stated to the writer that the general officers of his division had decided, at the first opportunity, to recommend Captain Fuller’s appointment as colonel of the 64th, as they considered him unusually competent, and the honor bravely earned. Gettysburg was the “mighty crash” predicted. Few knew and appreciated the high and honorable qualities of Capt. Henry V. Fuller more than the writer of this grateful tribute to his memory. I knew him thoroughly for twelve years as an honest boy and an upright man. He was incapable of dissimulation, and he scorned a base action. Few knew him but to respect him. Endowed with superior mental force; possessed of a fine, manly person, a handsome, pale, intellectual face, clear, gray eyes, brown hair; six feet in height, erect and dignified in his movements. He was of pleasing address and an interesting and forcible writer, as he was an engaging conversationalist and speaker. Had he survived the war, it was his intention to have devoted himself to the study and profession of law. I believe that he would have proved a very able jurist and a most eloquent advocate. His education was obtained in those great American institutions, the common schools, with a few terms in the Fredonia and Randolph Academies. At home, or in the camp, he was a lover of books of the higher class, and a devotee of the great poets. It is a singular fact that Capt. Fuller was never wounded in any engagement but in that in which his life was sacrificed. He never had a “leave-of-absence” until January, 1863, when he asked for twenty days, and Maj.-Gen. Hancock, commanding the 2d Corps, gave him twenty-five. He was never on the “sick-list” until, after the return from the “ill-fated Peninsular campaign,” he was ordered to the hospital, by the surgeon at Arlington Heights. While there, learning that the army (and his regiment) were moving up the Potomac, he deserted the hospital, overtook his regiment six miles above Washington City, marched with it, participated in the great battle of Antietam, and asked no favors of the surgeon. This gentleman is on his father’s side of English and on mother’s side of Scotch descent. He traces his lineage back to Daniel Nash, his great-great-grandfather, who resided in the State of Connecticut. His great-grandfather, Silas Nash, was born near Hartford, Conn., about the year 1765, and entered the army in the war of the Revolution from that State two years before its close, at the age of sixteen years. He subsequently removed to Chautauqua County, N.Y., the village of Nashville in that county being named after his son William, who was a prominent lawyer. Aaron Nash, one of Silas Nash’s sons, was killed at the burning of Buffalo while serving as a soldier from Chautauqua County, N.Y., in the war of 1812. Oscar F. Winship, a grandson of Silas Nash, was a captain in the regular army, and was brevetted for meritorious service in the Mexican war. The colonel’s grandfather, also named Silas, was born at Hartford, Conn., Aug. 23, 1784, and with Simeon Bunce, his brother-in-law, located in what is now the town of Dayton, in the year 1810. He was a member of the first Board of Supervisors of Cattaraugus County, and was also a member during many years thereafter. He was an honest and industrious man, and held in high esteem by all who knew him. Although a pioneer farmer, he took an active part in all the varied interests of his town and county, and performed well his part in advancing its growth and prosperity. He had two sons and tree daughters, who lived to maturity. Arus, the father of our subject, and the eldest, was born in 1811, - the first born in not only the town of Dayton, but the large town of Perry, which at that time embraced about one-fourth of the entire county. Dewitt Nash, brother of Arus, lives on the home farm which his father settled in 1810, has represented his town on the Board of Supervisors, is a good citizen, a kind neighbor, and a worthy man. The three daughters, Miranda, Almira, and Emeline, are (with exception of Miranda, who is deceased) living near the family homestead. Arus Nash was a successful farmer, and a man of marked traits of character. Passing his early days in the woods of Cattaraugus, he acquired a love for hunting, and was known as an expert marksman. Being ford of adventure, the gold fever and the excitement of 1849 induced him to make the overland trip to California. He went as leader of quite a party from this portion of the State, but died within a few months after reaching the Eldorado of the West. His wife, Christiana McMillan, was of Scotch descent, but a native of Warren County, N.Y., being born about the year 1814. Their family embraced eight children, - six sons and two daughters, - viz. : Corydon B., who died in Washington Territory; Mary A., who married Horace Howlett, of Dayton, but now a teacher and resident of Little Valley; Eugene A., of whom we write; Jane V., who is married and living in La Cygne, Kan.; Clinton D., who died while in the service of his country, as a Union soldier; Clayton S., murdered in Southwestern Nebraske in 1874; E. Hart, conductor on the Rochester and State Line Railroad; and Edwin B., who died quite young. Clinton, Clayton, and E. Hart, as well as Eugene, were all in the War of the Rebellion, each sustaining honorable records, and doing valiant service for their country. Clayton had the additional experience of a prison life in the hands of the rebels. Mrs. Christiana Nash died in Brooklyn, Wis., in 1858, aged about forty-four years. Col. Nash was born the 28th of March, 1837, near Nashville, Chautauqua Co., NY. He received a common-school education, followed by an academic course at the Albion Academy, Albion, Wis., and after graduating at the head of his class, taught Latin and mathematics for a year in the same institution. He then entered as junior in the Madison (Wis.) University, but completed his classical course at the Alfred University, N.Y., graduating with the honors of A.B. in July, 1860, and standing first in his class. He then entered the Albany Law School, having previously determined to pursue the legal profession; he received his degree, graduating in 1861, and was admitted to the bar. The war was then fully inaugurated, and being patriotic to the core, he cast aside his ambitious aspirations for legal honors, to take up the sword in defense of the imperiled nation. He enlisted in the famous “Forty-Fourth,” known as the “People’s Ellsworth Regiment,” Aug. 8, 1861, as a representative of the town of Dayton, in which command he saw valiant service, participating in the battle of Centreville, Siege of Yorktown, Hanover Court-House, Mechanicsville, Gaines’ Hill, Turkey Bend, Malvern Hill, Second Bull Run (where he was wounded), Antietam, Shepherdstown Ford, Fredericksburg, Ely’s Ford, Chancellorsville, Aldie, Gettysburg, Jones’ Cross-Roads, Williamsport, Rappahannock Station, Mine Run, the Wilderness, Laurel Hill, Spottsylvania, North Anna, and at Bethesda Church, where he was again and seriously wounded. Oct. 31, 1861, he was commissioned second lieutenant; Oct. 29, 1862, he was promoted to captain, on account of bravery shown in the “Seven Days’ Fight,” receiving honorable mention in general orders for his manifest heroism. He wnt before Casey’s Examining Board, which passed him for promotion, and soon after he was commissioned as lieutenant-colonel, and assigned to the command of the 23d United States Colored Troops. This was an honor he, fortunately, did not realize, for he was placed hors du combat by the wound he received at Bethesda Church, and was absent when the 23d was almost annihilated by the disastrous “mine explosion,” near Petersburg, Va., in July, 1864. Hence he never assumed command of that organization, its small remnant being merged into other regiments. He was not sufficiently recovered from his wound to report for duty until September, 1864. During his service he was for some time acting adjutant of his regiment, and commanded the same, in the advance on Richmond, up to the date of the battle of Bethesda Church. For nearly a year he also served as assistant inspector-general of the 3d Brigade, 1st Division, 5th Army Corps. Altogether, his military career was a notable one. After the war the colonel went to Washington, under appointment of Gov. 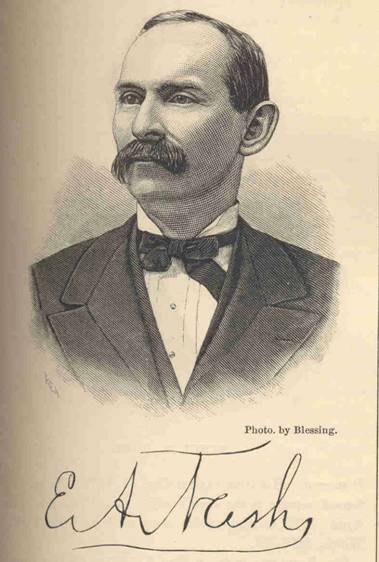 Fenton, where he served as State Agent for New York, but resigned the position and went to Kansas City, Mo. He there pursued the study of the law for a year and a half, when he returned to Perrysburg, this county, and commenced the practice of his profession, which he has continued ever since, with the exception of the years 1873 to 1876, - his incumbency of the office of clerk of the county of Cattaraugus. In 1868 he removed to Cattaraugus village, and in 1874 to Little Valley, where he at present resides and practices law, in connection with Mr. C.Z. Lincoln, as the firm of Nash & Lincoln. He has also served as supervisor seven years, representing New Albion for four, and Little Valley for three years, and of the latter town is the present incumbent of the position. It is hardly necessary to state that the colonel is a Republican in politics. Col. Nash was married, March 12, 1868, to Angie Clark, daughter of Orrin Clark, of Perrysburg, N.Y., and has one child, L. Eugene Nash. It is not necessary to enlarge upon the character of Mr. Nash, for in this county he is well known as a man of decided abilities, of great courage, persevering industry, and of marked integrity. Jaazaniah Howe, the grandfather of the present officiating county clerk of Cattaraugus County, was born in Goshen, Mass. He was a soldier in the Revolutionary army, enlisting at the age of seventeen, and served until the close of the war. Zimri Howe, son of the above, and father of our subject, was a native of the town of Granville, N.Y. He removed to Gowanda (then Lodi), in the year 1825, where he continued to reside until the fall of 1858, when he removed to Cattaraugus, Cattaraugus Co., N.Y. He died March 11, 1867. Esther, his wife, mother of A.H. Howe, died at Little Valley, March 13, 1878. Arthur H. Howe was born in that portion of Gowanda lying in the town of Collins, Erie Co., N.Y., the 7th day of October, 1843. He attended the union school of his native place, except two winters (1856-57) spent at the district school in Cattaraugus. In the fall of 1858 he came, with his father’s family, to this county to reside, and in the following spring went into the county clerk’s office, at Ellicottville, with E.H. Southwick’s successor, Thomas A.E. Lyman, until September, 1864, when he enlisted in the 98th Regiment New York State National Guard, which was stationed at Elmira, guarding rebel prisoners. In January, 1865, he was appointed deputy county clerk, by S.C. Springer, and performed the duties of the office about three years. Jan. 1, 1868, he was again appointed deputy clerk, by Enos C. Brooks. At the expiration of his term, Dec. 31, 1870, he removed to Ellicottville and engaged in the mercantile business with A.J. Adams. Jan. 1, 1874, he again resumed his pen in the clerk’s office, and July 4, 1875, Col. E.A. Nash, county clerk, appointed him his deputy. Years of service in this clerical capacity rendering him especially qualified for the position, he was nominated, in September, 1875, by the Republican party, for county clerk, and elected to the office over C.E. Haviland, Democrat. His term expires Dec. 31, 1879. He has performed service in the clerk’s office most of the time since April, 1859, serving under every clerk save one, W.W. Welch, 1871-73. Mr. Howe was married Dec. 4, 1867. He chose as his life companion Harriet Fox, a native of Ellicottville, this county. She is a daughter of Chauncey J. and Hannah H. Fox, pioneer settlers of this section, and still living at Ellicottville. A portrait and biographical notice of Mr. Fox may be found with the history of the last-named town. The family of Mr. and Mrs. Howe embraces two children. Mr. Howe, both as clerk and deputy, has always been a faithful and indefatigable official, whose continuous and zealous service merits commendation. As a citizen he is also respected and esteemed. One of the leading spirits of Western Cattaraugus, in the embodiment of business ability, combined with genial qualities and sterling worth, is he whose name stands at the head of this notice. Mr. Green was born in Tompkins Co., N.Y., Jan. 1, 1828. His father settled in Jamestown, N.Y., in the year 1833, and our subject resided there until he was twenty-two years of age. At the age of sixteen, however, he was apprenticed to the printing business, and followed it for five years. At the early age of twenty-one (in 1849) he embarked in mercantile pursuits, as being more to his tastes than the trade he had learned; and he has been engaged in merchandising, with but slight intermissions, ever since that time. His record as a merchant in Little Valley covers most of the time since the spring of 1850, commencing in this village the same season the construction of the Erie Railway was begun. Sept. 5, 1848, he was married to Miss Laura Ann Thompson, of Little Valley, who died June 8, 1867. Dec. 15, 1868, he married Miss Minnie Courtney, of Rushford, N.Y. In the earlier years of Mr. Green’s residence in Little Valley he was elected a justice of the peace, and several times served as town clerk. He officiated also as supervisor in the years of 1863 and 1865. 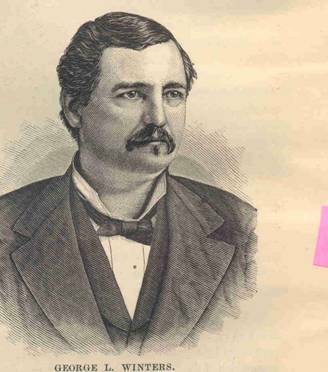 In the last-named year he was elected county superintendent of the poor, and in 1868 was re-elected, filling the office for six years, - making one of the most popular superintendents Cattaraugus County ever had. He was elected to the State Legislature in the fall of 1869, and received a re-nomination in the fall of 1870, by acclamation. He served two terms in that body, sustaining an honorable record. He was a faithful, indefatigable representative, always in his seat, and voting upon all questions from convictions of right and duty. Mr. Green was the first president of the village of Little Valley after its incorporation. He is a thorough patriot in every particular. At the County Centennial Celebration – held at Olean, July 4, 1876 – he was the reader of the Declaration of Independence, and enunciated the “inspired revelation of American liberty” with a clear, strong voice, fine emphasis, and a magnetic sympathy with the subject. Although not a member of any religious organization, he contributed liberally towards the erection of the Methodist Episcopal Church in Little Valley, and more recently towards its repair and in support of the ministry. Mr. Green is the owner of the “Palace Hotel,” at Little Valley (of which a fine view is given elsewhere), and although a “natural-born landlord,” prefers to let others manage is stead. Last spring he leased the hotel to Mr. F.K. Alvord, late of Nunda, N.Y., who is its present popular host. S.C. Green is still a resident of Little Valley, - a highly-esteemed citizen, of unsullied personal, character, and great private worth. The life of Mr. Winters has been comparatively uneventful, and, save in his military career, marked by few incidents except those which are commonly found in the lives of most of our successful and self-made men. He was emphatically a “man of affairs,” industrious, sagacious, and enterprising, early developing those qualities which have so largely contributed to his success. Alphonzo Winters, the father of our subject, was a resident for many years of Cannonsville, Delaware Co., N.Y., from which place he removed to Southport, in Chemung County, this State, where he worked for a few years, married, and moved West and located in Tecumseh, Mich., when that section was comparatively new, and where he died a few years after his settlement, in 1840, when George was but two years of age. His widow (mother of G.L. ), Sally C. Hyde, daughter of ‘Squire Hyde, of Southport, N.Y., after the death of her husband, moved with her family to Portville, Cattaraugus Co., N.Y., where her mother then resided. She subsequently married, but the two children of this marriage are both deceased. The Children of Alphonzo and Sally Winters were Sarah Eliza and Mary Elizabeth (twins), Alphonzo O., and the subject of this sketch. Mary E. died during their residence in Michigan; Sarah E. has been twice married (to Urial J. Pierce, deceased, and Andrew J. Buzzard, both of Humphrey, Cattaraugus Co.), and lives in the town of Humphrey; Alphonzo married Sarah Ely, of Franklinville, this county, is a farmer, and resides at the last-named place. George L. Winters was born in Tecumseh, Lenawce Co., Mich., April 30, 1838. He started out in life as a schoolteacher, teaching several terms; he has also worked at several mechanical pursuits, but has been mostly engaged in farming, for which avocation he has a preference over the many occupations which have engaged his attention. He contributed his full share of patriotism, and suffered more than the larger proportion of the volunteers in the late war of the Rebellion. Enlisting as a private in Company C, of the 154th Regiment, N.Y.V. Infantry, he rose rapidly, by successive promotions, through the grades of corporal, sergeant, “orderly,” second lieutenant, to the rank of captain; but the “fortunes (or rather the misfortunes) of war” prevented his being mustered upon the last-named commission, having an arm shot off in the memorable battle of Gettysburg, being taken prisoner, and having his arm amputated by a rebel surgeon. March 1, 1865, he was married to Miss Margaret Z. Pierce, daughter of John and Mary Pierce, of Ischua, this county, of which place she was a native. From the time of casting his first vote until the present time he has acted with the Republican party. He has held no office except the one of which he is the present incumbent, that of sheriff of Cattaraugus County, being elected thereto in the fall of 1876, in performing the duties of which he gives general satisfaction. It has been our aim to give in the military chapter of this history, an authentic and reasonably full account of the part taken by Cattaraugus County and her soldiers in the suppression of the Southern rebellion. 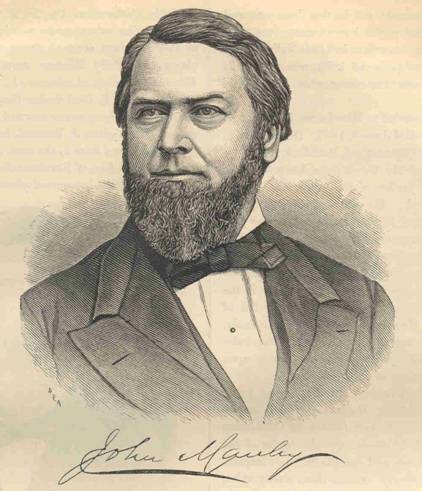 But no such account can be anything like complete if omitting particular mention of the part taken by John Manley, of Little Valley, who, though not a member of the Union army, rendered constant, indefatigable, and invaluable services to the cause, as is attested by a multitude of surviving officers and soldiers who were in the service. Having received an appointment as clerk in the Interior Department, at Washington, he was present in that city when the fall of Fort Sumter was announced. A company was that day organized in the Department, in which he was one of the first volunteers; and he served for the defense of the national capital during all the exigencies of 1861 and 1862. For nearly a year he was the only representative of this county in Washington. He witnessed the arrival of the first troops in that city; and as those from this county arrived was called upon to aid them in various ways, which service was always cheerfully rendered. In the history of the 37th Regiment is mentioned the letter written by Mr. (afterwards General) P.H. Jones, May 10, 1861, asking Mr. Manley, as the only representative of Cattaraugus in Washington, for information and assistance towards the raising of the first companies in the county. This was among the first of the thousands of applications (written and personal) which were made to him during the war, by officers and soldiers, for assistance in a multitude of forms, pecuniary and otherwise. The best testimony to these facts, and to the manner in which such applications were invariably responded to, is furnished by some of the letters received by him upon those matters, and of which he has more than four thousand now in his possession. From among these the following is given, as showing with what entire freedom – without fear of betrayal – he was made the medium of communication. It is from the letter of a subaltern complaining of the foisting of a stranger as major upon his regiment. “Furthermore, you must be the hearer of all our woes and regimental troubles. Under military regime, there is no one else to whom we can relate the story of our wrongs as to you!” Hundreds of letters asking aid came from privates; numberless ones from line and field officers; many from soldiers’ relatives at home. From the suggestions contained in these letters, many abuses were quietly corrected; while the confidences of all were ever held sacred. A paymaster neglecting to pay soldiers (of a regiment to him assigned) in hospitals for six months, on the complaint, in a soldier’s letter, to Mr. Manley, was ordered by Secretary Stanton to pay them on the following day; and that paymaster did so pay them! “Fort Ontario, Oswego, N.Y., Sept. 26, 1872. Mr. Manley early joined with other in organizing the “New York Soldiers’ Relief Association,” in Washington, which did a large amount of work, and he was secretary and on its executive committee during the war. He also during the war continued a weekly correspondence with the press of this county, giving full news of the Cattaraugus troops. These letters were deemed at the time of general interest. In March, 1865, Mr. Manley was appointed military secretary, with rank of colonel, on the staff of Governor Fenton, and on the 1st September was detailed as military State agent in New York City, where he remained until the closing of the soldiers’ depot in May following, when he resigned, receiving the written thanks of the Governor for the ability and fidelity with which he had performed his duties. John Manley is of Puritan stock, his ancestors on both the paternal and maternal side having crossed the ocean in the colonial days and settled in Plymouth County, Mass. He was born in Norridgewock, Me., May 26, 1824. For some years he resided in Augusta, Me., where he was married, June 24, 1847, to Elizabeth, daughter of Arno Bittues (a native of Bordeaux, France, who came to America, and was adopted by Governor Gilman, of Exeter, N.H.). The children of this marriage are three, - Annie Stevens and Laura Bittues, both born in Augusta (the latter married to Samuel Dunham), and John, born at Little Valley, August, 1866. In October, 1851, soon after the opening of the New York and Erie Railroad, Mr. Manley came to Little Valley, and has resided there since that time. He has taken an active part in the enterprises of the village and county. He was trustee of his school district three years, planned and aided in building the village school-house, one of the best in the county. When he resigned the position of military secretary to the Governor, in 1866, he bought the large “Howe farm,” laid out the village of Little Valley beyond its then small proportions, and used his energies to the building up and beautifying of the village. 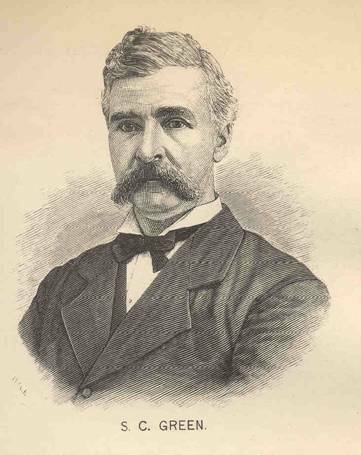 Col. Robert H. Shankland, the veteran and accomplished editor of the Ellicottville Union, though a personal friend for years, gravely charged Manley with the act of “stealing the old county-seat and tugging it over Fish Hill in his carpet-bag.” In 1866 he was appointed by the Board of Supervisors (with L.S. Jenks and F>L. Stowell) one of the commissioners, and by his associates was made superintendent, of the construction of the court-house and jail at Little Valley, 1867-68. Toward the expenses of erecting those buildings he gave largely, and also gave the land (five acres) on which they are located. In July, 1864, he (being then a clerk in the Interior Department) was appointed by the secretary of the interior as special agent for the New York Indians, and he visited all the tribes in this State, paid the annuities, addressed the Indians in regard to their Kansas land difficulties, schools, and agricultural interests. He was complimented on his return by the Indian Bureau, and his addresses and reports were published in full in the annual report. He resigned his position in the Interior Department 1st of April, 1865, having served four eventful years with fidelity, and bearing the honorable testimonials of chiefs. His appointment by President Grant as commissioner (with Messrs. Scattergood and Shanklin) to locate and lay out villages in the Allegany Reservation, under the law of Congress of Feb. 19, 1875, has already been noticed in the history of that reservation. Having lived in this county twenty-five years, and being fully conversant with the subject, he used his influence to make the villages large to accommodate the growth of business and white population, and to open it to a proper taxation. In this direction his labors were successful, and the citizens were very generally gratified with his efforts. Mr. Manley was seven times elected supervisor of Little Valley, - 1860, 1867, 1870, 1871, 1872, 1873, and 1874, being commissioner and superintendent of the construction of the court-house, resigned the office in 1867. In 1873 and 1874, he was a member of the Assembly of New York, elected on the Republican ticket, serving on the committees on internal affairs, claims, printing, military, charitable and religious societies. He served his constituents faithfully and honestly while in the Legislature, and left it with an unblemished record. In 1856 to 1860 he was secretary, and in 1870 and 1871 president, of the Cattaraugus County Agricultural Society, and in 1873 was a member of the executive committee of the New York State Agricultural Society. was born in the town of Collins, Erie Co., N.Y., April 18, 1837. He received a common district-school education before his sixteenth year, at which time he left home to learn the printing business. After completing his apprenticeship, he continued as a journeyman printer until 1858, when he commenced the publication of the Gowanda Reporter, at Gowanda, Cattaraugus Co., N.Y., associated with F.G. Stebbins. He remained in this connection until the breaking out of the Rebellion. May 19, 1859, he married Amy A. Aldrich. In October, 1861, he enlisted as a private in Company A, 64th Regiment New York Volunteers. He was promoted to corporal, and subsequently to the position of quartermaster-sergeant. In October, 1862, he was commissioned as second lieutenant, and assigned to duty in the line. Immediately after the battle of Fredericksburg, he was promoted to the rank of first lieutenant. 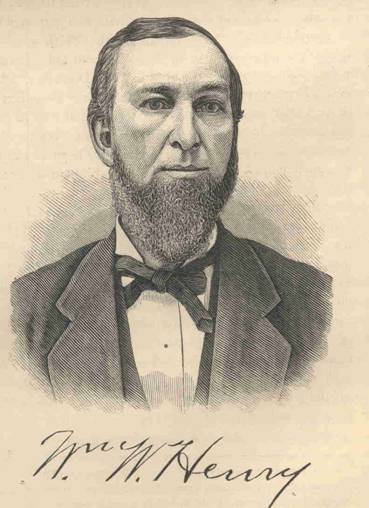 Leaving the service in June, 1863, he returned to Gowanda, N.Y., where he resided until 1871, filling various town and village offices, viz., town clerk, justice of the peace, trustee, and president of the village, and supervisor for the town of Persia. In January, 1871, he was appointed under-sheriff of Cattaraugus County, and removed to Little Valley, which has since been his residence. His service as under-sheriff was during the term of Sheriff William M. Brown. In the fall of 1873 he was nominated by the Democratic party as their candidate for the office of sheriff, and elected by seven hundred majority, running some two thousand votes ahead of his ticket, - the Republican majority in the county at that time being from eleven to thirteen hundred votes. Mr. Henry is at present filling the honorable position of president of the village of Little Valley. son of Lyman and Harriet Lee, was born in Little Valley, Dec. 2, 1834. Lyman Lee was a native of Guilford, Conn. (born in 1799), but emigrated with his wife, goods, and stock from Bloomfield, N.Y., to Cattaraugus County, in the spring of 1821, and settled on a one-hundred-acre tract of land, where the cheese-factory now stands, and from which not a stick of timber had been cut. He cut enough timber to build a shanty, and moved into it before fireplace or chimney were built, in the hurry to clear some land to put in spring crops. He put in some corn and potatoes, and three acres of winter wheat from seed brought from Monroe Co., N.Y. In April of this year there was a heavy snow-fall, and Mr. Lee and other settlers had to feed their stock by browsing trees and using the straw from their own beds, until not a spear of straw was left in the neighborhood. It was not until late in the fall following that their house, with fireplace and chimney, was completed. Meanwhile they planted a nursery of apple- and pear-trees, the latter of which are yet standing. In the fall of 1823, Mr. Lee and Stephen Crosby made an exchange of farms, the one taken by the former being one hundred acres, with twenty acres improved, a log house, frame barn,* and a small nursery of apple-trees. Lyman Lee lived upon this farm until his death, in 1851. His widow still resides there with her son, Erastus, and his family. It was in this, the oldest house standing in the town, that Erastus Lee was born. His mother was born in Tioga Co., Pa., in the year 1800, and is consequently now in her seventy-ninth year. 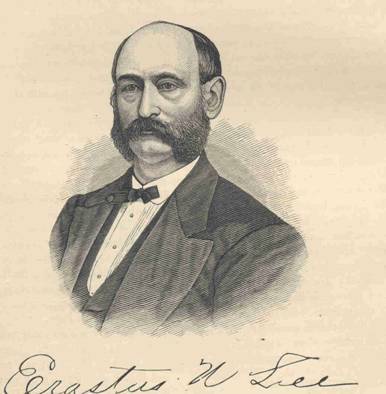 Erastus N. Lee has been engaged all his life in farming and in mercantile pursuits, having for years carried on a general store at the village of Little Valley. In the year 1866 he represented his town in the Board of Supervisors, and was re-elected the following year. Mr. Lee resides upon the homestead farm before mentioned, in the house in which he was born. * The first frame building erected in the town.